Macaroni and cheese remains my ultimate comfort food, but I generally don’t have the time to do it right. This variation is a decent compromise between the convenience of boxed mac & cheese and the awesomeness of the made-from-scratch variety. Bring at least 2 quarts of water to a boil, add salt, then stir in the macaroni. The idea here is to salt to water so that we’re also partially salting the pasta. Follow the package’s directions for cooking time. About 2 minutes before the pasta has finished cooking, add in the frozen peas. If necessary, kick the heat higher to get it back to a boil. Zap the soysage links in the microwave for 1 minute, then slice into 1/4″ pieces. By this point, the pasta+peas should be done cooking, so remove them from heat and drain. In the same pot you cooked the pasta in, melt the butter over low heat. Once melted, add 1 tbs of milk, a couple of dashes of hot sauce, and the cheese packet. Wisk together until smooth. If it’s too clumpy, keep adding more milk, 1 tbs at a time until you’re happy with the sauce’s consistency. Finish it off with a few grinds of black pepper. 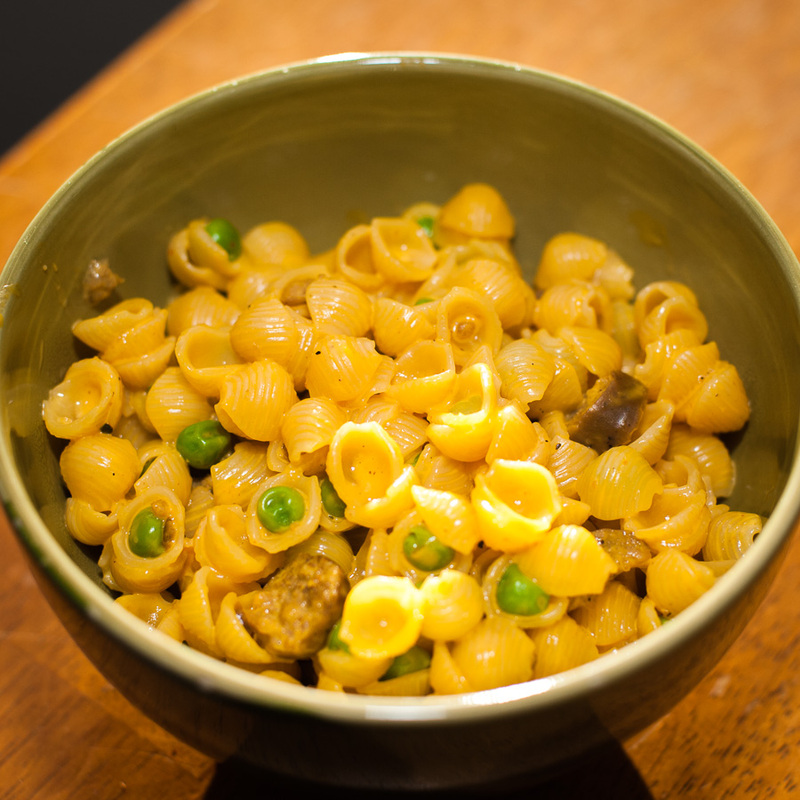 Stir in the pasta+peas+soysage. Admire your handiwork, then eat it. This entry was posted in Cooking, Personal by Todd Kulesza. Bookmark the permalink.